VIDEO: What do you think was the context of this event? Watch Epic Fight Video Below..
July 11th, Las Vegas, Nevada MGM grand garden arena was the sight of in many peoples opinions was the fight of the decade. Both fighting in the welterweight division both are highly skilled and tactical fighters. Watch the video below showing the highlights of this highly touted fight. 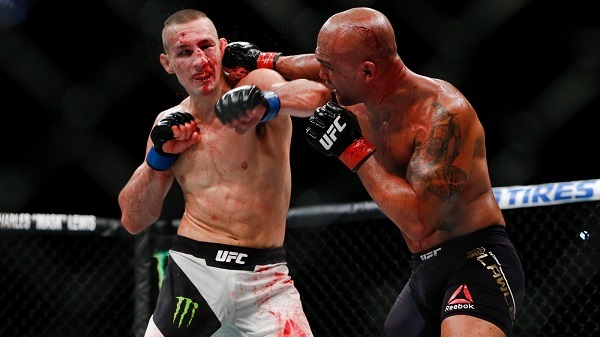 Ultimate Fighting Championship (UFC) welterweights Robbie Lawler and Rory MacDonald clashed once more at UFC 189 inside MGM Grand Garden Arena in Las Vegas, Nevada. Lawler had an absolutely incredible 2014, winning three fights and securing the title. Last night, he looked to defend his title for the first time and continue his impressive streak.